For years, the ancient ginkgo biloba has been known to botanists as the oldest living tree species. 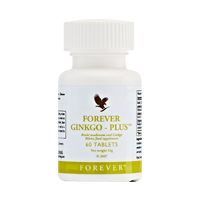 Ginkgo leaves have been shown to naturally contain two types of chemicals, flavonoids and terpenoids, but Forever Ginkgo Plus has also been enhanced by reishi mushrooms, schisandra berries and fo-ti root. Reishi, Schisandra Chinensis, Cured Fo-Ti, thickener (microcrystalline cellulose), ginkgo biloba extract, anti-caking agent (stearic acid), emulsifier (magnesium stearate), firming agent (croscarmellose sodium), anti-caking agent (tricalcium phosphate).